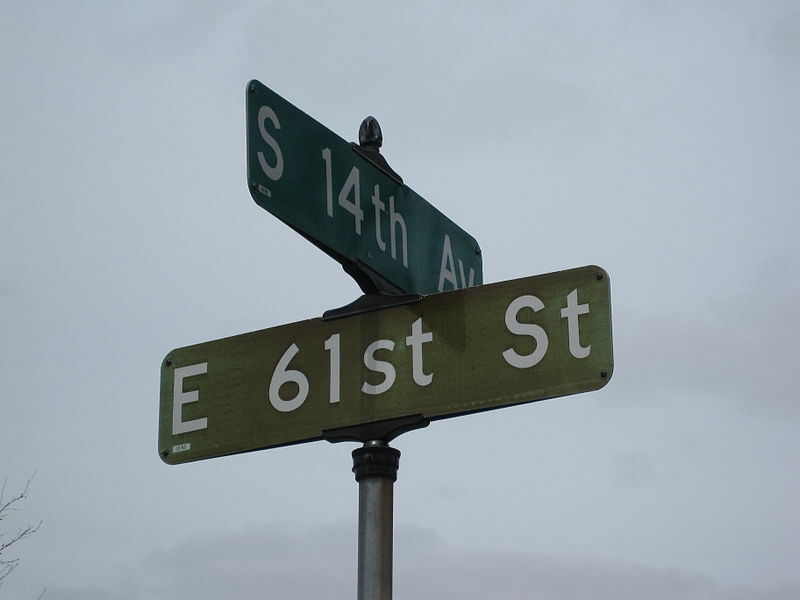 1 – “14th Avenue” and “61st Street” signs in Minneapolis (© Ed Kohler – The Deets). The street name -aka “odonym” or “street toponym”- is a name identifying a public space in an urban area, usually an area of free pedestrian and vehicular movement giving access to buildings or private areas. The street names are usually part of the address and are generally composed of the “specific”, that is the own name of the place to be identified, plus a street type designation -aka the “generic”- that details the type of public space: e.g. “street” or “square”. This term is also called street suffix, road/street type designation or finally road/street designation. In English and other germanics languages the street type designations are used as suffixes, but broadly speaking in latin languages (such as French, →Italian, Spanish…) the street designations are placed before the specific name. 2 – Comparison between a latin street name (e.g. Italian, on the left) and English (right): in Italian, the street type designation (“viale“, meaning “Avenue”) is placed before the specific, instead in English is placed after the specific. On the left: “viale IV novembre” street sign in Lodi, Italy. On the right: “Bull Lane” street sign in Winchcombe, Gloucestershire, UK. The numerous, different types of public spaces can be thought of as belonging to two main categories: street and squares (or plazas). The former are developed along a main direction (length) and generally devoted to the transit of people or vehichles, while the latter feature a significant second dimension (width), are typical of urban areas, and are intended (at least in the European urbanistics) for social aggregation rather than simple transit. The generic denomination often refers to a specific street types, indeed –namely to specific purpouse, characteristics or morphology of a road e.g. Rise would be for a sloping way and Bend for a curved one. Nevertheless, in common usage it can also be uncorrelated: it’s not for sure, for example, that an Avenue always looks different from a Street. This may be due to historical reasons or local use of terms. Moreover, there also are street names that have no generic designation: e.g. the famous “Broadway” or also “The Corso” just to name only the most common. 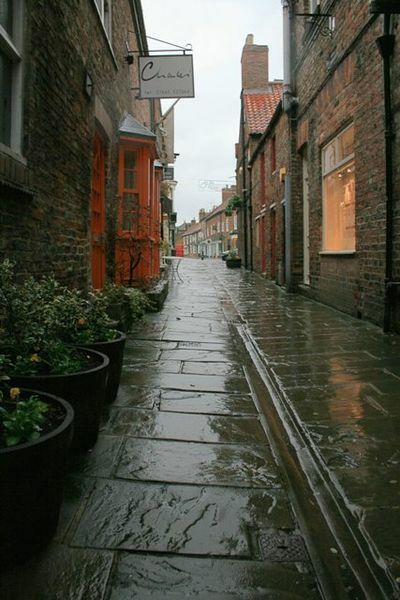 3 – “Bakers Alley” in Thirsk, England. Acres: (pl. of acre) land, area (acre is a common, variable unit of land measure). Both in US and British Isles, this is usually a suburban residential road (es. “Lynn Acres“, Moundsville, WV). Alley (Aly. ): narrow street between buildings, in the older parts of town and cities. Back streets of building, that often have no name, are generally called alleyway (British Isles) or alley (USA). In UK, alleways behind rowhouses are typical of cities with an industrial history, such Manchester. Annex (Anx. ): a road that is an addition to the main roadway. Approach (App. ): especially in England, a road that approches a landmark from which it is named after (e.g. “Church App.“, “Foundry —” in Leeds). Arcade (Arc. ): a covered shopping street; the first of this type were built in Paris in 19th Century (passages). Avenue (Av. o Ave.): a main or wide street, often lined by trees (from French avenue, c. 1600, from avenu, past participle of avenir “to come to, arrive,”). An avenue is usually more important than a →Street, although the terms are often used synonymously. 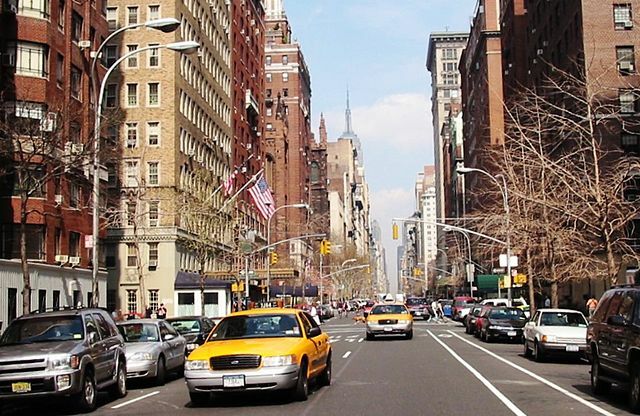 In Manhattan, avenues run north and south while streets run east and west; other American cities followed this rule. 4 – “Fifth Avenue” in New York. embank, river; i.e a road that line a river or lake: e.g. “Lake Bank” in Littleborough, Eng. row; a road lined by houses (see also →Row): e.g. “Chowdene Bank” in Gateshead, Eng. Bay: inlet, a body of water enclosed by a curve of the coast around it; in Canada this is a short local lane that ends with a circular space allowing vehicles to turn around (e.g. Elm Bay). In the USA they are called →Court or →Cove. Bend (Bnd. ): in the USA this is an arch–shaped local road, usually dead–end (e.g. “Horsesoe Bend“, “Pine —“). Bluff (Blf. ): cliff, headland; in Texas this is a local road. Boardwalk: along the East Coast of the USA this is a seaside promenade made of wooden boards and reserved for pedestrians. The first “Boardwalk” was built in Atlantic City in 1870. 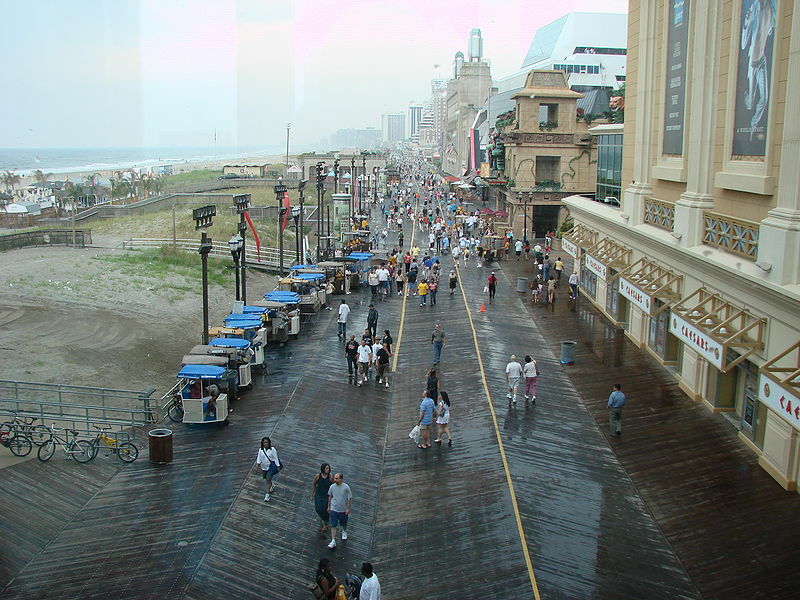 5 – The wooden “Boardwalk” in Atlantic City (NJ). Boulevard (Bvd. o Blvd. ): alley, avenue; from French boulevard (15th Century), from Germanic bolwerk that originally indicated a road built along defensive walls. From 19th Century (France) the boulevards have become the avenues traced on the old medieval walls, enclosing the historic centre: e.g. in Nottingham (UK). In the USA and in Australia (where you can find also the “Boulevarde” variant) a boulevard is usually an arterial road. 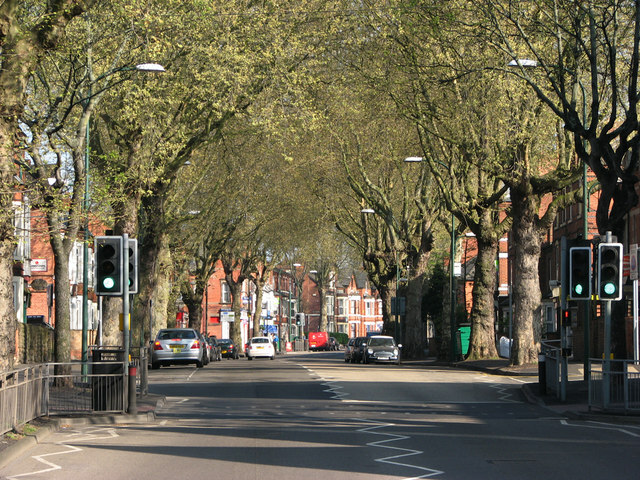 6 – “Lenton Boulevard” in Nottingham (UK); it is one of the boulevards that enclose the historic centre. 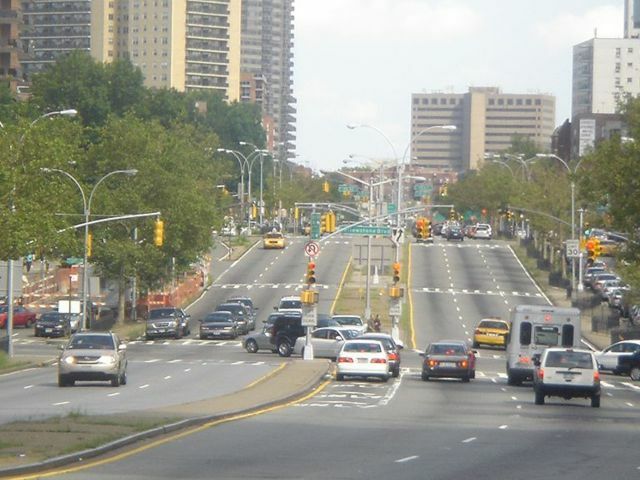 7 – “Queen Boulevard” is one of the most important arterial road of New York. Bow: bend; a curved road (e.g. “Upper Bow” and “West —” in Edinburgh, Scotland). Brae: slope; from the Scottish for hillslope. Branch (Br. ): ramification; local road (USA). Broadway (Bdway o Bdwy. ): this is the main street in some USA cities (New York City, Baltimora, Chicago, Los Angeles, Miami, Minot ND, Tampa FL, Kansas City). It derives from Dutch Breede weg and dates back to New Amsterdam, a 17th-century settlement established at the southern tip of Manhattan Island. “Broadway” is usually the full name of a street, exept for N.Y. where, in addition to the “Broadway” i.e the north-south main axe, there are also streets called “Est Bdwy.“, “West —” and “Old —”. 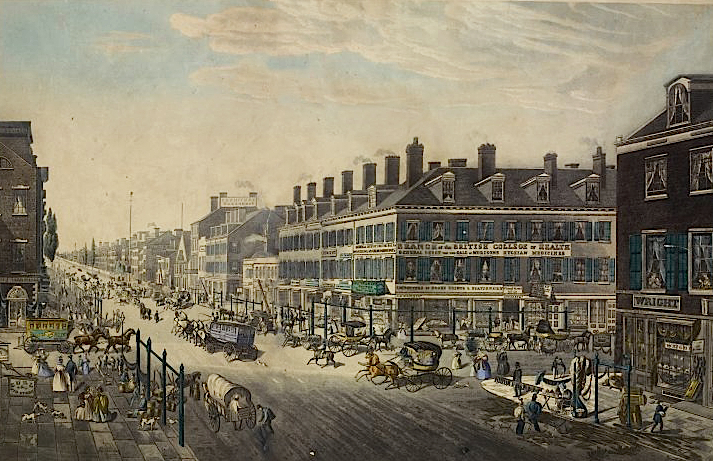 8 – The historic “Broadway” of New York in 1834. Brow: forehead, ridge, edge of a steep place; British for slope street (es. Chapel Brow, Tintwistle, England). Canyon: deep valley with steep sides, from Spanish cañón. It usually refers to dead–end local roads, just like →Court. Causeway (Cswy. o Caus. ): from Middle English caucewaye, “raised road”, from Medieval Latin via calciata: “paved way”; generally a raised road across water or marshy ground. In Miami (FL), “Causeways” are main roads reaching the isles of Miami Beach and Kay Biscayne: these are a mixture of embankments, islets, elevated sections and drawbridges. 9 – “Venetian Causeway“, Sout (Beach Miami): built in 1925, it pass through the bay and the Venetian Islands to Miami Beach. It includes bridges and islets and it is enlisted in the National Register of Historic Places. Chase (Ch. ): hunting ground, British for dead—end local roads (Poets Chase, Squirrel —). 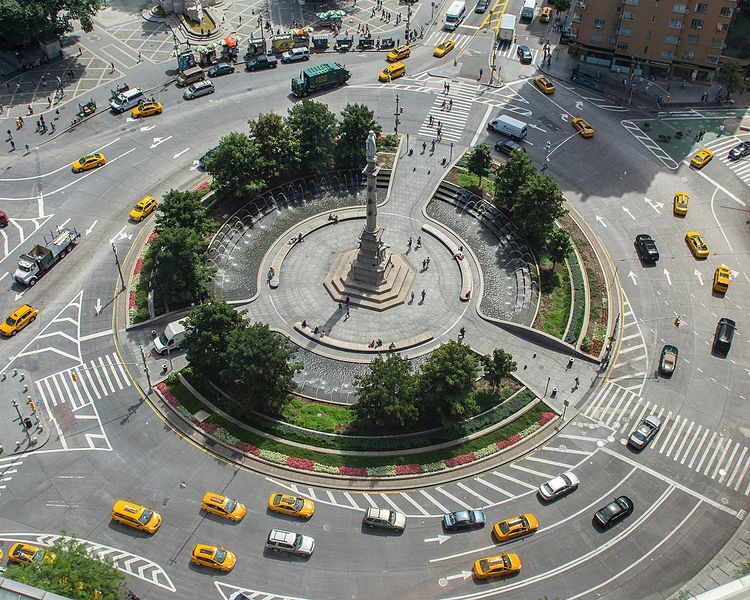 (USA) circular plaza that usually coincides with a traffic circle and features a central island reserved for pedestrian–only use (e.g. a park or garden). The most famous “circles” in the U.S.A. are “Dupont Circle” in Washington D.C. (which gives its name to the historic district); “Monument —” in Indianapolis, “Lee —” in New Orleans and “Columbus —” in New York City. (UK) in London, “Inner Circle” this is a circular–shape road enclosing the Queen Mary’s Garden. (USA) especially in Illinois anfd Tennessee, this is a branch that returns to the main road, thus establishing a roughly “circular” path (e.g. “Coventry Cir.” in Glendale Heights IL, “Woodside —“in Nashville TN; “Liegh Anna —” in Lafayette TN). Circuit (Cct. ): Australia; i.e. a local road following a closed path (es. “Botanical Circuit“, Banora Point NSW; “Elmwood —” Blakeview SA). Circus (Crcs. ): UK, a →plaza or →roundabout where other roads converge. 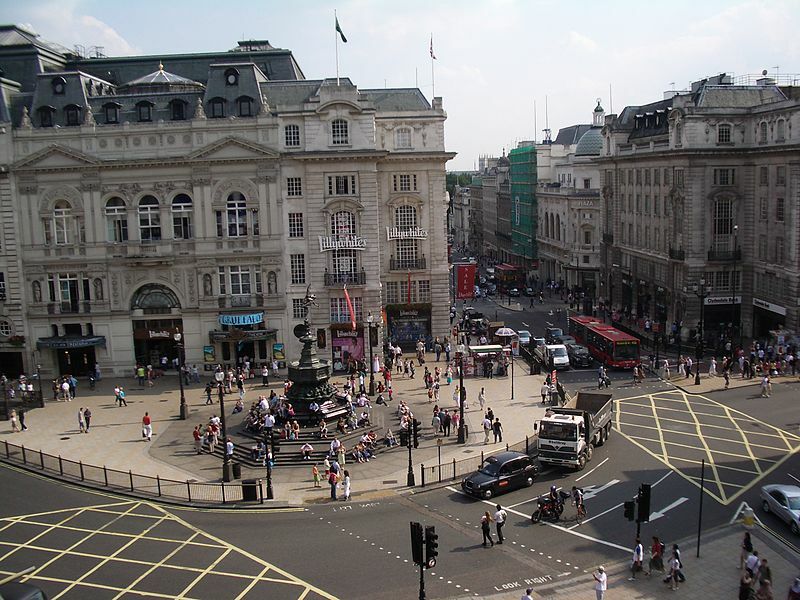 “Piccadilly Circus” is a famous square in London, named after the original “circus”, i.e. a circular junction (roundabout), lost in 1886 with the construction of Shaftesbury Avenue. 11 – “Piccadilly Circus” in London (J.Cormack/Commons). Close (Cl. ): residential road, often dead–end (esp. in British Isles). Common (Cmmn. ): in the USA this is a residential road (e.g. “Wolcott Cmmn.” in Freemont CA that is a Branch of “Wolcott Dr.”). Common Road: in UK this is usually a rural road. A 1855 British manual for engineers defines a common road as a branch of a main road, but this description can fit a variety of street types. Concession: in Canada, especially in Ontario, this is a former “concession road” or rather a road laid out by the colonial government through undeveloped Crown land to provide access to rows of newly surveyed lots intended for new settlers. Concession roads ran usually parallel to the north shore of Lake Ontario or to the southern boundary line of a county and formed, whit cross-cutting roads called →sidelines or →lines, an orthogonal grid plan of 100–acres lots.Concession roads are usually numbered, e.g. “Concession 10th”. Corner: local dead-end road (Eng.). Cottages: in British isles i.e. a road serving some “cottages” that are typical small rural houses. Court (Ct.): courtyard, a cul-de-sac or rather a dead–end road. Typically in North America it ends with circular widening, which makes it easy to turn around. These are also called →Point, in Minnesota →Circle or →Cove , in Canada →Bay. 12 – A typical North American “court”: “Dumfries Ct.” in Sacramento, California (H. W. Schmitt/Commons). Courtyard: local, residential road (e.g. “March Courtyard“, “September —” in Gateshead, England). Cove (Cv. ): small bay or cave; found in Tennessee (esp. in Memphis and Nashville) as a synonym of →Court. Creek (Crk. ): stream, smaller than a river; in USA are called “stream” some local roads. 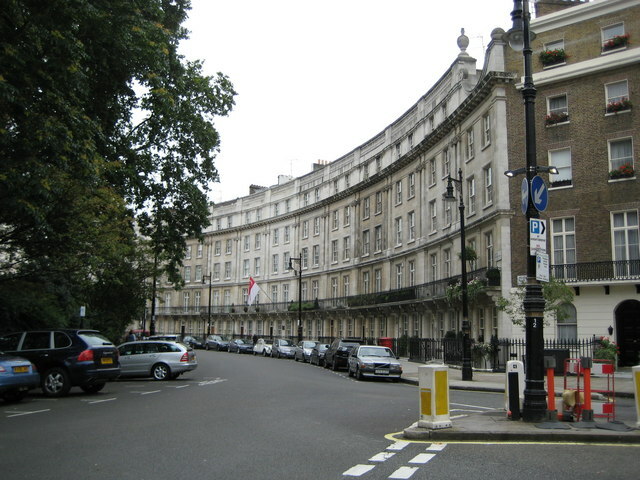 13 – London: “Wilton Crescent“, with the 19th century crescent-shaped buildings (N.Cox/Geograph). Crest: highest part of a hill or mountain range; local road lying on a creek (found in Ireland and North America). Croft: piccola fattoria, appezzamento; in England i.e. a local road (es. Well Croft, Oak Croft). Curve: a curved street (USA, e.g. “Brockton Curve“, “4th —“). Dale (Dl. ): from Norse for hollow; in England this is a local road (e.g. “Wellspring Dale“, Nottingham). Dene: sandy ground, dune (from Middle English 11th—16th Century) or narrow, wooden valley (from Old English Denu, valley). Local road in England (es. “Milton Dene“, “Oak —“). 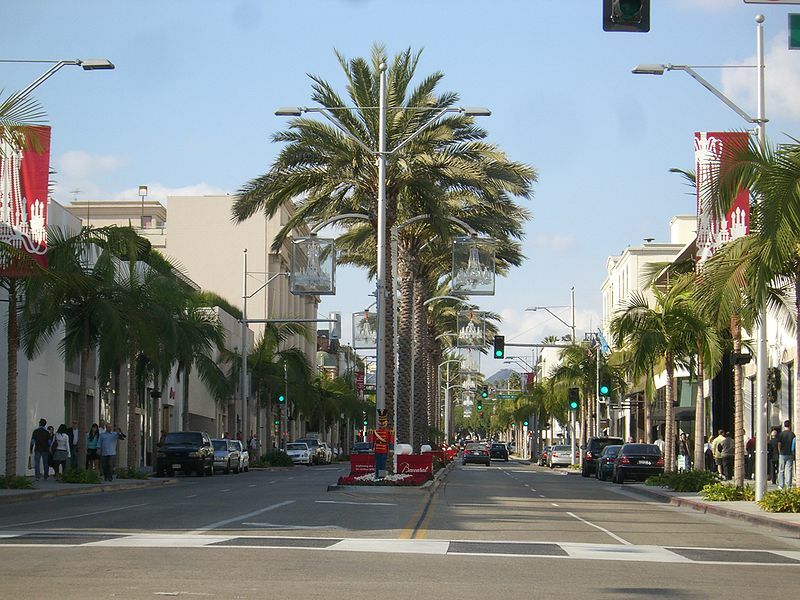 14 – “Rodeo Drive” in Los Angels (D.Delso/Commons). Drive (Dr.): street intended for vehicular traffic. In US many famous roads are called Drive: e.g. “Ocean Drive” in Miami, “Rodeo Drive” in Beverly Hills or the “Mulholland Drive” in Hollywood. However, this is a quite common denomination for every type of road. Drung: only in Newfoundland (Canada); i.e a local road. In Newfoundland English (aka Newfinese) the word drung means a «narrow lane, or passage between houses, fenced gardens, etc.» On the island there are some road called drung (“Cotters Drung“, “Roman’s —“, “Long —” etc.). Esplanade (Esp. ): a walkway or →Promenade next to water, often used as synonym of It derives from French esplanade (15th century), in turn from Spanish or Italian,  originally meaning the wide space left around the fortifications in order to expose attackers to defensive artillery fire. Estate: large land property. In England i.e. a local road in building complex, which can be either a housing estate (e.g. “Peabody Estate“) or a industrial estate (e.g. “Addison Industrial Estate“). Extension (Ext. o Extn. ): an addition to an existen road with the same name. E.g. “Robinson Street Ext.” (Pittsburg, PA) is an extension of “Robinson Street“. Frontage Road: in North America this is a road that flanks an highway (e.g. “East Frontage Rd.”). Gardens (Gdns.) or Garden (Gdn. ): in England, this is a local road lined by gardens of rowhouses (aka terraced houses) or villas, just like →Row or →Terrace. Garth: fenced yard or garden. In England, this is a local road lined by private gardens (es. Oakwood Garth, Bartons —). Gate: cancello, porta; this could be both a short connection between two more important road or the entrance road of a town (es. Slant Gate a Kirkburton, UK). Green (Gn. ): in England, local road that lines a lawn (eg. some greens in Dudley, UK). Grove (Gr. ): small forest or woods (from Old English grāf); local road lined by gardens of rowhouses or villas (just like →Gardens). Found in Australia (e.g. in Caulfield North) and British Isles. Heights (Hts. ): altezza, altitudine, sommità; in North America this is a local road. Hill (Hl. ): collina; local road, steep or with elevations; found in British Isles (e.g. “Gipsy Hill“, London; “Laurel —” in Newry, Northern Ireland) and North America (e.g. “Wabash River —“). Island (is. ): i.e. a road on a island: in Newry (Nothern Ireland) “Sugar Island” is the main road of the river island of the same name. Key (Ky.): low island, shoal, reef (from Spanish cayo) or wharf from Old French kay, cay from hence also →Quay. In Broadbeach Waters (Queensland, Australia) are kalled “key” some local residential lanes (especially the branches of “T. E. Peters Dr.” e “Merrimac Blvd.”), interposed with the canals built since 1960s after the reclamation of coastal marshes in the Golden Coast area. Landing (Lndg. o Ldg. ): place of disembarkation; in North America this is usually a dead–end road near a watercourse (e.g. West Landing in Williamsburg, USA; Picnic — in Darmouth, Canada). Lane (Ln. ): very common, this is a local road (especially a residential one) intended for vehichles. Lea: lawn, field, meadow; term used until 19th century from Middle English leie (11th–16th century). In England this is a local road (e.g. “Close Lea“, “Ridge —“). 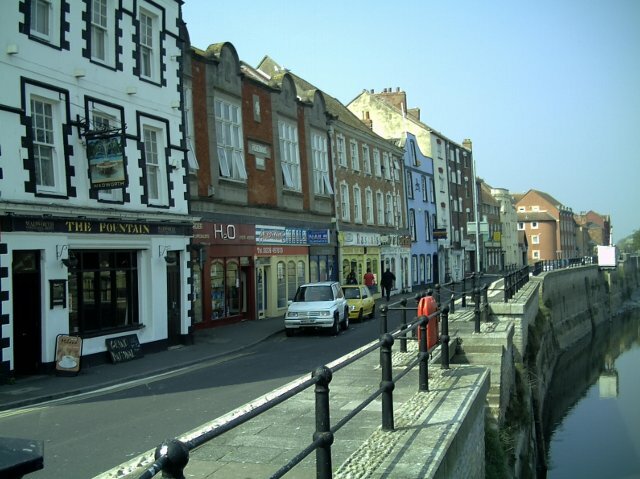 Leigh: in England this is a street of rowhouses (e.g. “Oak Leigh“, “Ivy —” in Liverpool); synonymous to →Terrace. Line: in Canada this is a “Concession Road” (see →Concession). Loop: in North America this is a loop–shaped local road (e.g. “Choctaw Loop“, “Lake —“); “City Centre Loop” in Leeds (England) is a roundabout. Manor: the house and land of a lord or the main house on an estate, from antique French manoir; this is a local road in Ireland (e.g. “Oakwood Manor“, “Rahanine —“) and Texas (US). Mead: Antique English for →Meadow, in England this alludes to a pre–existing place for pasture (e.g. “Castle Mead“, “Crane —“). Meadow: pasture, flat and grassy area; in Englad this alludes to a pre–existing meadow (e.g. “Castle Meadow” in Norfolk). 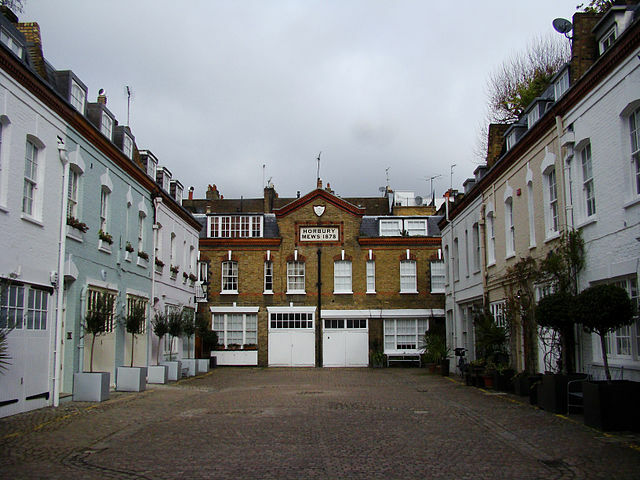 Mews: this is a paved street lined by “mews“, that are typically british row of stables, usually with carriage houses below and living quarters above, built between 17th and 18th centuries (from mew that in falconry is a birdhouse for one or more birds of prey). 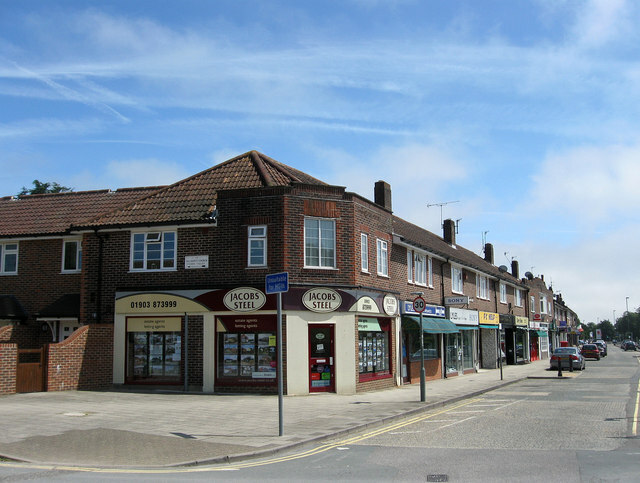 Today the term indicates, more generally, a street lined by rows of two–story buildings (e.g. “Wansbeck Mews“). Found also in Australia (e.g. “Orion —” in Melbourne). Mimms: local dead–end road; found only in Hemel Hempstead, England (“Little Mimms”, “Long –”, “East —“). Mount (Mt. ): mountain or hill, from Middle English mont (11th–15th century). In England i.e. a local road (e.g. St. Nicholas Mount, Beech —). Orchard (Orch. ): in England, i.e. a local road lined by gardens of rowhouses or villas, just like →Gardens (“Cherry Orchard“, “Knights —“). Parade (Pde. ): this is a street lined by shop windows (e.g. “Bank Parade” in Burnley, UK); found in British Isles and Australia. 16 – “Kings Parade” in Findon, West Sussex (S. Carey/Geograph). Park: generally an urban park (e.g. “Hyde Park in London” or “Central Park” in New York” only to mention the most known ones), but also found in England for streets lined by private gardens (just like →Garden; e.g. Elm Park in London). 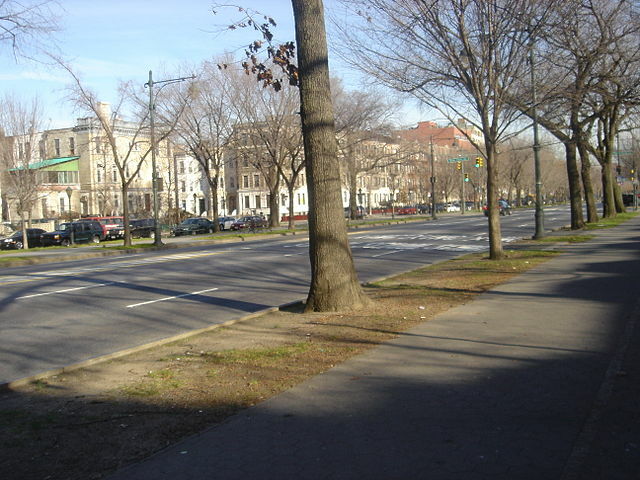 17 – “Eastern Parkway” in Brooklyn, New York. avenue (→) tree-lined streets, originally intendend for stroll, bicycles and horses or horse–drawn vehicles. The first parkwyas were developed in 19th century by urbanists Frederick Law Olmsted (1822–1903) and Beatrix Farrand (1872–1959). The first road of this type is Eastern Parkway in Brooklyn (NY)  The term has been coined by Olmsted itself and by urbanist Calvert Vaux (1824-1895) in their proposal to link cities and suburban parks with “pleasure roads”. Between 1868 and 1876 Olmsted and Vaux built several parkways in Buffalo (NY) in the Delaware Park–Front Park System. controlled–access road, especially scenic and from which trucks and other heavy vehicles are excluded. See →Parkway (2). Pass: passage, in U.K. and U.S.A. this is a local road. Path: a narrow walk or also a localo road (North America). Pike: in U.S.A. (esp. in North and North-West regions) this is a main road, originally intended as a toll road but not necessarily so (e.g.. Otsego Pike in Ohio); from “turnpike” (barrier). Place (Pl. ): usually a residential and commercial street, often dead–end (but not necessarily so); found basically everywhere. Well known is Melrose Pl. in West Hollywood (California), from which named after a famous soap opera of the 90s. Plain (Pln. ): usually this is a widening where two or more road intersect (e.g. Bank Plain in Norwich, UK). Plaza (Plz. o Plza. ): a public square in a city or town, from Spanish plaza for “square”. Point (Pt. o Pnt. ): in North America this is a dead–end local road that end with a circular shaped widening, which makes it easy to turn around (just like →Court or →Cove: e.g. Mersey Point in Eagan, Minnesota, or Elm — in St Albert, Canada). In Edimburgh, “Main —” is a junction of the three roads. Private: private–owned road, found only in Ottawa, Canada (es. “Osnabrook Private“). Promenade (Prom. ): stroll, from French promener (1560-70), meaning “to go out (for a walk)”; i.e. an avenue intended for stroll or walking, but it is often used as synonymous of →Esplanade. Quay (qy. ): landing place, wharf, this is a street or road that runs along a river, a canal or a lake. Found in England (Bridgwater), Northern Ireland (Belfast, along the river Lagan or in Newry and Mourne, along the canal Newry), in Canada (“Queen’s —” in Toronto) and Singapore. 18 – “West Quay” along River Parret in Bridgwater, England. Ridge (Rdg. o Rdge. ): long, narrow elevation of land; this is a local road in the presence of a land slope; found in U.S.A. and England. Rise: climbing street, i.e. a local road (non necessarily sloping); found in England (e.g. “Trinity Rise“) and Ireland (e.g. “Newcastle Wood —“). Road (Rd. ): thisi is the most common and generic designation for a road. It should label an extra–urban one whose primary function is the transit, as opposed to →Street that is instead an urban road; however de facto it is often used synonimously. Row: fila, schiera; in British Isles is a street of rowhouses or similar (es. “Elm Row“, a main street in Edimburgh). Royd: from Teutonic, a place that has been ridded of trees; found in Yorkshire as local road (e.g. “Oak Royd“, “Arnold —“). Run: pista, corsa; local road with many curves, esp. in Michigan. Some historic streets in Philadelphia was earlier also labeled run (“Gunner’s Run”, “Pegg’s —”). Side, Sideline o Sideroad: in Canada, these are minor rural roads that run perpendicularly to the →Concession Roads and border agricultural lots; these are usually numbered (e.g. “Sideline 22”). Shores (Shrs. ): this is a road along the edge of a water surface like a lake or a river (e.g. “Chanticleer Shores“). Spring (Spg. ): fonte, small local roads lined by villas, found in England (e.g. “Pierian Spring“) and U.S.A. (e.g. some “Spring” in San Antonio, Texas). Spur: a branch road, found in U.S.A. (“Branch Spur“, “Stake —“). Square: i.e. an open area where two or more streets meet. This is usually an open public space commonly found in the heart of a traditional town, used for community gatherings ( e.g. “Trafalgar Square” in London). In North America, where the public squares are rare and usually limited to the older central districts; the term “square” often refers to an irregular–shaped commercial area formed around a widening at the intersection of three or more streets (e.g. the famous “Time Square” in New York), or also to a small square–shaped public garden that occupies an urban block and surrounding roads (e.g. “Union —” and “Madison —” in New York). In British Isles also some streets may be labeled as square (e.g. “Leichester —” in Bristol). Stravenue (Stra. ): portmanteau of →Street and →Avenue, is a type of road particular to Tucson, Arizona, that run diagonally between and intersects a Street and an Avenue. By convention, in Tucson, streets run east-west while avenues run north-south. In a few areas, mainly around the railroad tracks running diagonally from southeast to northwest, builders created small subdivisions of roads and houses that also are laid out on a diagonal basis: these streets was called “stravenue”. It was told that the term “Stravenue” was originally coined by Roy Drachman when he was developing the subdivision called Pueblo Gardens in 1948. Street (Str. ): from Latin via strata, paved road. This is the more common suffix for urban roads and should be used in a built environment. Opposite to →Road, whose primary function is the transit, the Street also serve a social function, allowing neighbors to meet and interact on their walks, fostering economic activity such as window shopping and sidewalk cafes. 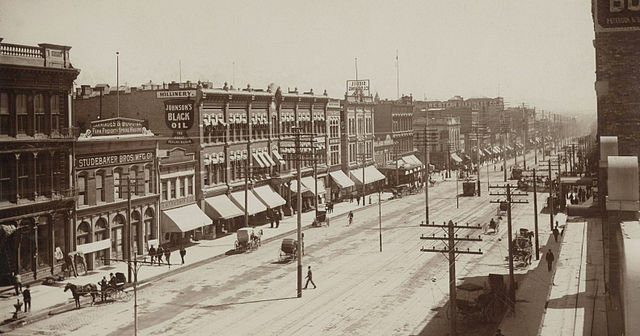 19 – “Main Street” in Salt Lake City, 1890. Terrace (Tce. o Ter. ): in United Kingdom this is a street of terrace houses or terraces, also known as rowhouses. In U.S.A. and Australia is more broadly a residential road (with a few exceptions, e.g. “St.Paul Terrace” in Brisbane that is a four–lane main road). Trail (Trl. ): usually a a narrow, unpaved walk; in the U.S.A. it could be also a residential (e.g. some “Trails” in Newtown, CT) or extra–urban roads (es. “Lake —”, Indiana). Vale: valley; in British Isles a local road, likely in the presence of a depression (e.g. “Elm Vale” in Liverpool). Vennel: vein, from Antoique French venelle, in turn form Latin vēna. 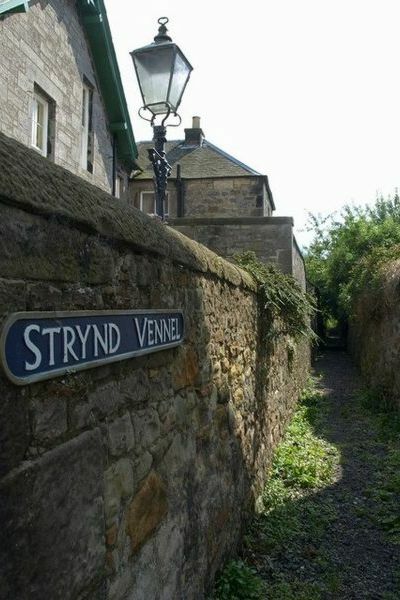 This is an →Alley o →Lane, a passage between buildings; found in Scotland and North East of England. View: in British Isles i.e. a rised road that offers some kind of scenic view (e.g. “Tyne View“, in Newcastle upon Tyne, from which one can see the river Tyne). Walk: local road (not necessarily pedestrian–only) in England and Australia. Way: widespread, it fits to any type of road or street. I derives from Old English weg, “road”, “path”, from wich also the Latin viae. Wood or Woods: in the British Isles, a local road of villas (just like →Gardens). There are a lot of terms, in Englis, to designate road network and highways, that are not properly suffixes but it’s still interesting to know. In USA the Numbered Highways have a federal numbering, but they may also have a local denomination. The highways are major or arterial roads, they may or may not have dual carriageway, at–grade intersection or direct access to private properties; they could be toll or toll–free, controlled–access or just limited–access roads. There is not always a clear distinction between the various terms, the choice of which it is due to local use of language more than in real technical differences between the infrastructures. Byway: in U.S.A. this labels about 150 roads that are designated as “National Scenic Byway” or “All-American Road” for one or more of six “intrinsic qualities”: archeological, cultural, historic, natural, recreational, and scenic. Corridor: in U.S.A. this is an highway of the “Appalachian Development Highway System”, in the Appalachia region. Expressway: (Expy.) it could be both a controlled–access highway or a limited–access highway, , with separate carriageways and no at-grade intersections, that could be toll or toll–free. Freeway: (Fwy.) the Institute of Transportation Engineers define a Freeway as a controlled–access or limited–access highway, with separate carriageways and no at-grade intersections, that could be toll or toll–free; it also distinguishes two types of freeway: the type “A” are the ones in metropolitan areas, with complex patterns with many connections (usually the ring roads); the type “B” are all the other ones. Anyway, in the common language the term “Freeway” usually refers to a toll–free highway, often used as a synonym of →Expressway. Highway (Hwy. ): in British English this is a primarly a legal term can be applied to any type of public road, but in common speaking it usually refers to longer ones. In North America and Australia it usually means a national controlled–access highways or limited–access highways, or also any long road, giving a relatively fast connection between two places, but that does not necessarily have the characteristics of the former (e.g. the U.S. Routes). Interstate: in U.S.A., this is a toll controlled–access highway that is part of the “Interstate Highway System”. Motorway (Mwy): synonym of →Expressway, in the U.K. it is a controlled-access highway. Parkway (Pkwy): in U.S.A. and Canada this is a scenic →Freeway, usually it has many curves to fit the orography of the land and could be closed to trucks and heavy vehicles (in New York and Cincinnati) due to limited height of some underpasses. E.g. the “Natchez Trace Pkwy“ and “Blue Ridge —”: the former covers 715 km from Nantchez (Missisipi) to Nashville (Tenessee), passing through Alabama and Tombigbee National Park (TN), the latter covers 755 km through Applachian Mountains from Shenandoa National Park to the Great Smoky Mountains one. In Minneapolis the “parkways” are major avenues. The term “Parkway” could also mean a tree–lined avenue intended for walking, see →Parkway (1). Route: in U.S.A. this is one of the “U.S. Numbered Highways”, it does not necessarily have separate carriageway. The longest one is the “U.S. Route 20″ from Newport (Oregon) to Boston (Massachussets) that covers 5 209 km. Thruway: this usually applies to New York State Thruways, a system of toll controlled–access highways. Turnpike: in U.S.A. is a toll controlled-acces highway (eg: “Massachusetts Turnpike“, “Pennsylvania —”). 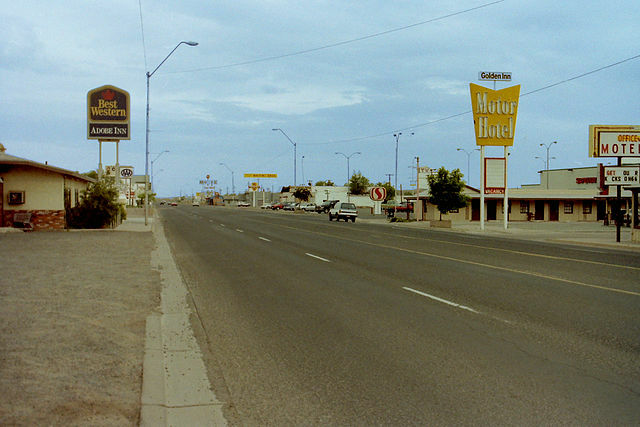 21 – The “Historic Route 66″ (ora “Historic Route 66”) all’altezza di Holbrook, in Arizona. Originally posted in Italian, 13th Mar. 2014. This list includes suffixes that appear in the names of at least two different roads that have at least one access to private properties (with house number or equivalent) and then can appear in a postal address. Unless otherwise stated, it is understood that the designation is used in the three main areas of English language: the British Isles, North America and Oceania. Where indicated “North America” means the United States and Canada, for “British Isles” means the United Kingdom and Ireland. If you want to help update the list, please contact us. “Official USPS Abbreviations.” U.S. Postal Service. Web. 1-3-2013. “Etymology Of British Place-names.” Bartholomew’s Gazetteer of the British Isle c.a 1900: Rootsweb. Web. 13 Mar. 2014. “Street, Road, etc.” The Word Detective.” The Word Detective. Web. 2 Mar. 2013. “Street Suffix Abbreviations.” Mbiz. University of Michigan, n.d. Web. 15-3-014. Online Etymology Dictionary Douglas Harper, Web. Dictionary and Thesaurus – The Free Dictionary. Farlex. Web. 1-3-2013. Southworth, M e E. Ben–Joseph “Reconsidering the cul–de–sac” in Acces 24, nº24 spring 2004. University of California. © Ed Kohler – The Deets (courtesy of Ed Kohler) – Flickr. left: Friedrichstrasse [CC-BY-SA-3.0 / GFDL] – Commons; right: L Chadwick [CC-BY-SA-2.0] – Commons. © Mick Garratt [CC-BY-SA-2.0] – Geograph. Y. Shinyama, 2002, New York [PD] – Commons. 2007, Atlantic City [PD] – Commons. David Lally, 2007, Nottingham [PD] – Geograph. Nuttmeger, 2006, New York [PD] – Commons. 1834, da una cartolina dell’epoca [PD] – Commons. M. Averette, 2008 [CC-BY-SA-3.0 / GNU-GFDL] – Commons. TarHeel4793, New York 25 agosto 2015 [CC-BY-SA 4.0] Commons. J. Cormack, 2005, London [CC-BY-SA-2.0] – Commons. H. W. Schmitt, 2007 – Commons. Nigel Cox, 2008 [CC-BY-SA-2.0] – Geograph. Diego Delso, 2006 [CC-BY-SA-3.0] – Commons. Ivan Moskalev, 2010 [CC-BY-SA-3.0] – Commons. Simon Carey, 2013 [CC-BY-SA-2.0] – Geograph. Nutmegger, 31-12-2006 [PD] – Commons. Kicior99, 20-5-2008 [PD] – Commons. Charles Roscoe Savage, 1890 c.a [PD] – Church History Library, via Commons. © Derek Harper, Cullross 17-9-2008 [CC-BY-SA-2.0] – Geograph. © Nikater, 1998 [PD] Commons. Work protected from plagiarism www.patamu.com deposit number 36001.